What is an exit ticket? The exit ticket is simply a question that is posed to all students prior to a lesson or class ending. Students write their answer on a card or piece of paper and hand it in as they exit. This formative assessment technique engages all students and provides the all important evidence of student learning for the teacher. Exit tickets give teachers a way to assess how well students understand the material they are learning in class. This tool can be used daily or weekly, depending on the unit being taught. Are you looking for a quick snapshot of your students’ understanding of math concepts? 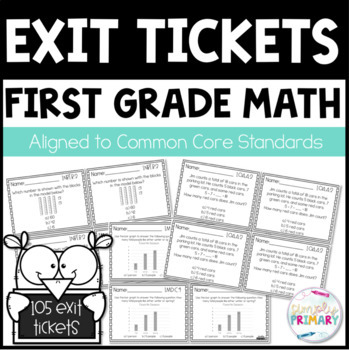 This Common Core Exit Ticket Bundle for First Grade Math Standards includes quick and easy exit tickets for all of the first grade math standards. Each exit ticket contains 1 question to quickly check student understanding of the common core standard. Each standard has 5 different questions to cover all components of the standard.